This photo was taken on November 13, 2018 at 7:27 AM. The location was in the entrance drive of a historic hotel next to the Potomac River in Washington DC. The "Take It!" came to me immediately as I got out of my car at this great hotel which is one of my regular stops. I had rained and strange as it may seem, I always go into high alert when there is water on the ground, be it in the street, sidewalk, drive ways, - you name it - if it will puddle or form shapes - I am intent on finding it. 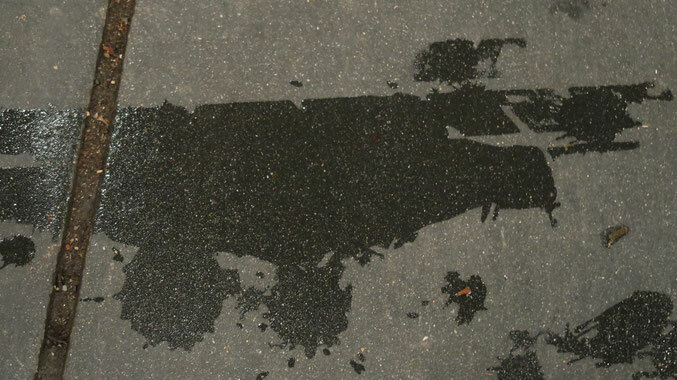 This bit of collected surface water - caught my eye with its two round spots connected by what by this interpretation is an axle which served to connect the rounds which then became wheels and the undercarriage to a vintage war plane. To further define this bit of imagination - I envisioned some of the water formation on the top of the main body (fuselage) of the plane to be a machine gun which was sometimes found in this location on these old planes. A second person in the plane along with the pilot would stand while the plane was in flight and fire the gun at the opponent. Needless to say this kind of combat must have been both thrilling along with being beyond dangerous. The After Take: I showed this to a number of people as I was happy to have made the catch. Without much verbal preparation by me - most were able to immediately join me in the imagined vision of the aircraft. Here is hoping you too can see this lucky photographic catch. PS: This type of photography, calls for a sharpening of the speed of conjuring a definable image from the water on the surface as in no time at all - the image can be lost as the water may shift due to gravitational pull or any number of other things such as wind or the addition of more water through continued rain. This all to say - catch it now - is the theme of the moment. "Spot on" about sums it up, it really is! I love those old bi & tri planes. I can't imagine dog fighting in one of them, but they sure are cool too look at. After our youngest said 'he spelled we wrong' I decided it was a good time for a history lesson and that WWI means World War 1. I think she's still a little too young to grasp it lol. Wouldn't that have been funny if you found that right outside the air and space museum? Look at that its got wheels and everything!! !